What is so revolutionary about a brushless motor? It combines all the benefits of a professional AC Motor Dryer with the lightness and versatility of a DC Motor and more. Airspeed 150Km/h – yes really! Ultra-fast airflow delivers superior drying power to reduce drying time using less heat meaning less damage. 40% less noise. Light and quiet operation with patented noise reduction technology. Quality The innovative brushless motor that powers this dryer has been tested to last up to 5000 hours. Most hairdryer motors use carbon brushes that wear out over time causing the motor to stop working. For example a standard AC motor has an expected motor life of 500 hours. This next generation -SmartTech' brushless motor uses magnets and electronics to drive the motor, extending the life of the dryer by 10x. If you were to use your 3Q High Performance Dryer every day for 15 minutes each day, you can expect the motor to last more than 50 years! Smart Tech brushless 2200W motor with airspeed 150Km/h for quick less-damaging drying. 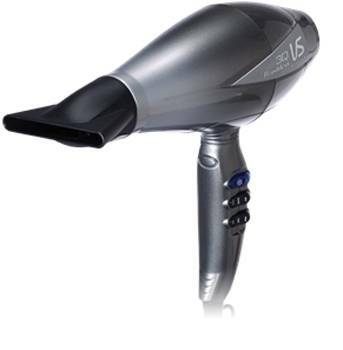 Lightweight – the 3Q High Performance Dryer weighs only 480gms meaning you can dry in comfort and with complete control. High ionic conditioning eliminates static and styles faster while trapping moisture to reduce frizzies by up to 75%. Ceramic technology enables hair to more easily and effectively absorb heat in a way that minimises damage and stress. 6 control settings - 3 heat and 3 speed settings so you can customise for your hair type. True cold setting – allowing you to set your hair. The 3Q High Performance Dryer, unlike many other dryers, cuts the motor rather than turning off the heat, meaning it works straightaway and is genuinely cold. Concentrator – allows you to style with greater precision. Diffuser – to build life and volume and to dry natural curls. Scrunch dry to create texture and loose waves. 2.7m long cord for easy manoeuvrability.